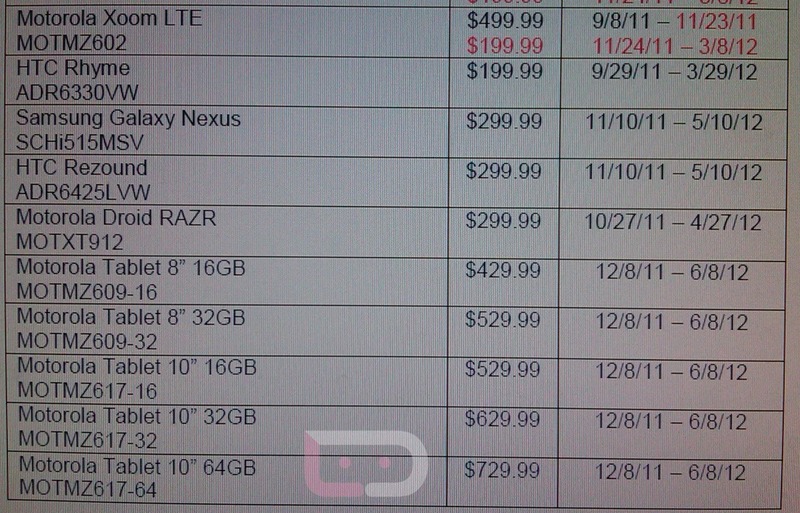 In the latest MAP (minimum advertised price) list from Verizon, we get a first look at official on-contract pricing for the new XOOM 2 models that could be in stores during the second week of December. Both the 8″ and 10″ models ranging from 16GB to 64GB are featured at prices starting at $429. The biggest of them all is the 64GB XOOM 2 10″ that will drop in at a whoppin’ $729. Pricing matches up to the current scheme for the 4G LTE Galaxy Tab 10.1, in case you were wondering how we came to the conclusion that these weren’t off-contract. You will notice that the tablet is being referred to as the “Motorola Tablet” which is a pretty good sign that some last minute changes to the name have occurred and they won’t be going with XOOM 2 here in the states. We are now officially worried that DROID XYBOARD has made the final cut. And below is the mention we just received concerning the release of the Galaxy Nexus. It looks like 11/28 was indeed one of the original targets, but regions are no longer expecting it to land that day. Over the last few days we have seen evidence that December 8 is the new target, so are we assuming that the 28th is completely out of the picture too? 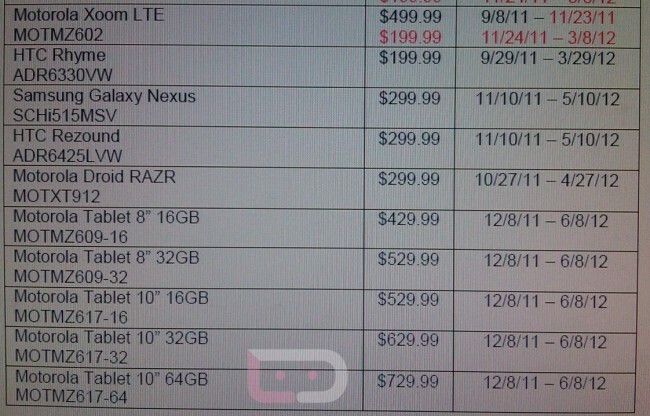 Update: Business Insider is claiming to have heard directly from Samsung that the Galaxy Nexus will launch in December. No other details were given, but that certainly matches up to the most recent dates that we have seen.